Every time I go to the seaside villages in Romania I am fascinated by the old times cooking pots and pans they use and by how those old pots can be cleaned to be made to shine. You have this pot and it's been in a corner for quite a while, it' looks dull and grey and one almost cannot guess what the initial color of it was. You do not really want to have this pot just sitting in the corner. You scrub and scrub and scrub, and if you use the right cleansing materials, eventually you will have a shiny, new-looking pot to use. Not that I would use a copper pot for my cooking right now but you get my metaphor, right? The problem today is that most of us feel just like this old pot in the corner - about our bodies and about ourselves. We live but it seems more like surviving, we lack "the bling" in ourselves. We wake up in the morning and we mostly think "oh, no, just another day". We are sometimes even jealous about shining happy people we sometimes see - but we believe that we lack the "genes" or "It's too late", or "well, I am like that. nothing I can do". I used to feel and be like this. I used to get dizzy every time I would get up or stand up, I used to have no energy. I used to get up in the morning and see just a pile of things to do. I had glimpses of love or of how wonderful life can be but for the most part I did not know where to begin and thought it was a lost battle, almost every day. Part of it was - I was looking at my outside life for solutions, when actually it was inside that I was supposed to search. My body was sluggish and did not digest well, I had lost of little "things" going on, lots and lots of little uneases in my body - and in my mind, a cloggy mist. My negative emotions were running the show and we all know, I believe, what gets created from that base.. When my son was one year old I had experienced skin cancer and I was also terribly depressed. At times I did not see the way out of it all. Well, not anymore. I decided to take my life in my own hands and make something wonderful out of it. I decided to empower myself and find my own way out of the fog and unclearness -and start to shine. Only 3 years ago I felt lost. Now I live the life of my dreams and every day it gets better and better. I feel healthier than I have ever felt. I have tons more energy and patience and, for the first time in my life, when people ask me how I am, I can sincerely say I am GREAT! Shining Mama was born out of my desire to share my shine discoveries and experiments. My upcoming SHINE Basics is an introduction in all that you can be, so that you rise up every day as a better and healthier version of you. I want to offer you the tools that helped me - and my private clients - to have every day a more wonderful life. I want to support you to feel good in your body and be able and willing to shout from every roof how great you feel. Shine Basics is a four weeks program. We start on Friday, June 27th. Every Friday we will have a live 3 hours workshop. There will be of course place for your questions and for sharing our experiences. You will also receive written materials to support you on your journey to shine. Everybody will also receive the audio recording of the workshops so that you can re-listen or in case you had to miss it. If you feel like that old cooking pot in the corner, this is a wonderful chance for you to empower yourself and start thriving, within your own body. Take the decision to start at the roots and give your life a new lease, grow new confidence and amazing wellbeing. 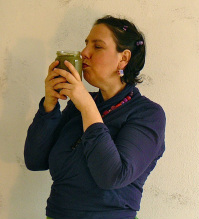 Within SHINE Basics we will talk about how to feed ourselves: our seen and unseen bodies. We will also look at how we can get in touch again with our soul, so that we can express it's eternal wellbeing in our lives, right now. And at how each of us can take that old pot from the corner and make it shine.